get six of those as well. I absolute love, LOVE, the design. As many of you know, I am a huge fan of the black and red color scheme and the MPOW Magneto Bluetooth Headset pulls it off wonderfully. Black dominates the color scheme but there is a very, very, very slight tint of red on the metallic part of the earpiece. The rubber ear piece is composed of a clear rubber with the inner rim being red. It gives off this real cool look that is simply awesome. It gives off just enough red to know that it’s there but not strong enough where it takes away from the elegant look of the Magneto headset. Now, I mentioned the metallic outer earpiece. The whole thing is not made of metal, just the out face of the headset. The Magneto logo sits elegantly in the corner of the earpiece. This design is top notch. You rarely see any metallic style headsets. Most are made of plastic and even though the plastic is extremely durable, it doesn’t give off a sleek, elegant vibe. This MPOW Magneto headset definitely does. For this reason alone, I wouldn’t recommend using this headset for any exercising or physical activity. If you want to, you can. Don’t get me wrong, but I wouldn’t. Why risk damaging or scratching them up during some vigorous exercise? Lastly, the controls are located on the wire as opposed to the one of the earpieces. I don’t know how I feel about that just yet. I think I’ve gotten used to having the controls on the piece that seeing that bar on the wire is a bit weird to me. BUT… I do notice that this could be a play for a better design. Again, I think the headset looks extremely sleek and if there were buttons on the earpieces, it may take away from that elegance. Once I was done admiring the design, I got to setting up this bad boy for usage. I plucked out the headset from the cool box it comes in, I grabbed my MicroUSB cable, and grabbed the small plastic bag containing the rubber ear pieces and stabilizers. I set aside the ear stabilizers. You have 3 sets of the round and curved ones. I’m not the biggest of fans of them so I don’t think I’ll be using them much. They do come in different sizes, but the difference is sizes is barely noticeable. I placed them back in the box and started looking for the MicroUSB port. The port is hidden under a subtle rubber flap right on top of the right ear piece. Again, love the design. The port cover is not a different color, it doesn’t stand out, and it’s easily accessible. One of the problems that I’ve had in the past is that the port would be covered by rubber flap that would be difficult to remove unless your fingers came equipped with claws. This is sooooooo not the case with the MPOW Magneto Bluetooth Headset and I am extremely grateful to MPOW for it. Anyways, I plugged it in and started to charge it up. There is a small indicator light on the control bar that switches from orange to white. When it’s charging, it’ll be orange. When fully charged, it’ll turn white. Once done, I grabbed them and gave them a go. Here is how that went. The control bar is a small that is no more than an inch and a half long and is situated on the wire connecting the earpieces. It has a soft, rubbery feel, it composes of 3 buttons (on button, + button, and – button), and has a small microphone built in for calls and what not. Turning on the MPOW Magneto Bluetooth Headset is simple enough. You just press and hold the on button for a second or two and you’ll hear the familiar, “Power on”, female voice that MPOW uses for their devices. Turning the volume of the music up and down is as simple as pressing the + and – buttons. Long pressing the - button skips forward while the + skips backwards. The on button also works to start and pause music, as well as answer and hang up calls. If on a call and you feel the need to mute your mic, you can press the + and - buttons simultaneously and a low tone will alert you that you are now muted. Hmmm… what else. I guess that’s pretty much it for the sound bar. Not a bother at all, easily accessible, and simple enough to use. By pressing and holding the on button for about 5 seconds, the headset will go into pairing mode. At this point, enable Bluetooth on your device and look for, “MPOW Magneto”, and connect. Once again, I have to give props to MPOW for having their devices display their actual names when pairing. You won’t get a weird device name like, “B9000”, or “MX-10”, or anything like that. Once paired up, your device will now automatically connect to that same device the next time you turn on the headset. This makes it effortless to connect. Just turn on, turn on Bluetooth, and you’re good to go. I had a 100% success rate automatically connecting. Also, the device claims a connectivity range of approx. 30 feet. I tested this outside and found that it’s closer to 35 feet or so. Not too bad at all. I was able to connect with my Samsung Galaxy, Kindle Fire, and Windows 7 laptop without a problem. Easy connectivity! I love it! Once paired up, I started to listen to some tunes. First, I started off with my usual line up of hard rock. I like to start off here because this genre really gives me a great sense of the mid and high sound while it incorporates a tad of the lows. After a slew of Iron Maiden, Metallica, Pantera, and Slayer songs, I am confident in saying that the MPOW Magneto Bluetooth Headset has great sound. I was able to distinguish the guitars from the bass and I didn’t get a muddy sound in between. And the drumming really popped when it came to the bass drum. Now, I say great, not excellent, but that’s because you can’t deem them excellent on just one genre alone. After several classical tunes, rap music, techno, ska, R&B, and some smooth jazz, I can definitely say that this headset has excellent sound! The HD stereo sound shines the most while listening to classical music. This is so since classical pieces has the most instruments and a wide range of sounds. Everything was crystal clear, the highs are crisp, the mids are warm, and the bass is booming. Regardless of the genre, the sound quality will be too notch when listening with this headset. I also wanted to test them out while watching a TV show or movie. I already knew that the MPOW Magneto would have great sound but I wouldn’t be doing my due diligence if I didn’t at least test it out. I loaded up Little Shop of Horrors (HEY! Don’t judge me! Lol) and gave it a listen. As expected, excellent sound quality. Voices were loud and clear and the music came through well. Absolutely no complaints in the sound department at all. Now, call functions on headphones/headsets are nice feature to have but to be honest, I just don’t see myself using it much. Maybe because I’m part of that generation where everything is text or Email. BUT, in case you are one of those that prefers a chat over a text, I tested out the call features over Skype and through my phone. As for using the headset for Skype, while connected to my Windows 7 laptop, I found it quick and easy to dial up the wife to test the microphone that is hidden in the control bar. There was no complaints about the sound quality of the microphone. I didn’t sound distant and there wasn’t any static at all. Also, during a phone call, not once did I hear a, “Dude, I can’t hear you.” Lol This was a common problem with headsets that have the microphone hidden in the earpiece as opposed to a control bar that sits closer to your mouth. Makes absolute sense, now that I think of it, that my voice would be picked up clearer on the MPOW Magneto Bluetooth Headset than on other headsets. 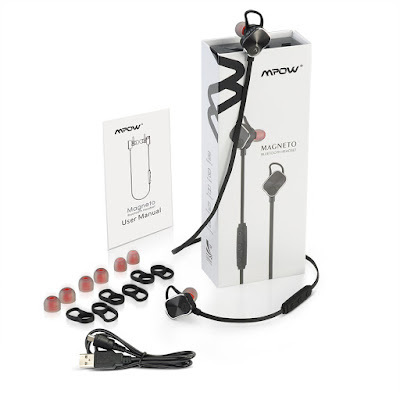 The MPOW Magneto Bluetooth Headset has an awesome 8 hour battery life. 8 HOURS!!! Most Bluetooth headsets that I have tried out and tested maxed out at about 5 hours so I super happy with this long lasting headset. I travel a lot and it’s common for me to forget to charge my headset. Considering that I commute daily for about 5 hours, not charging my headset means on long trip with no music. That’s no fun at all, friends. But with this headset, if I were to forget to charge them, the chances that I would have enough juice to get me through my trip are greater. And the awesome part is that it charges up from dead to 100% in about 2 hours. That’s just about the same amount of time that other headsets need and they will only give you a max of 5 hours. Longer battery life is always a HUGE plus for me! 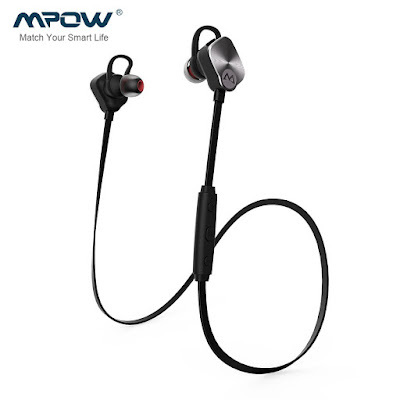 So there you have it, my experience and review of the MPOW Magneto Bluetooth Headset. 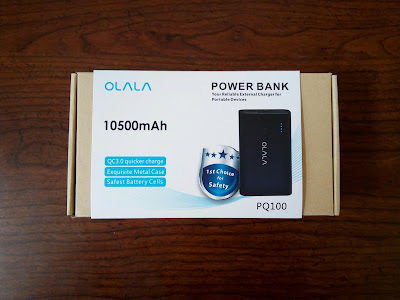 The design is freakin’ awesome, the sound quality is top notch, they are extremely easy to use, and they seem to last for forever on a single charge. I know that the market is oversaturated with Bluetooth headsets and headphones but the beauty of it is that there is a pair out there for you. If you travel much and want a set that looks great, sounds great, and will last until you get to your destination, then you have to pick up this Magneto headset. You can get yours now on Amazon for under $35. An investment well worth it if you ask me. You should pick one up today before they sell out. So what do you guys think? What do you like about this headset? What don’t you like? What are you experiences with Bluetooth headsets? Let’s hear it in the comments, friends! Later!